Urgent language and violent imagery. This is always the order of the day for the first Sunday of Advent. The liturgical tradition of the church brings us these sorts of readings to get us ready for the coming of Christ at Christmas. Angst filled and scary language gets us ready to meet the infant child, meek and mild. What’s going on here? Well, when we consider where this language situates us in God’s story of his relentless love for the world (the whole of the Scriptures) we will, I think and hope, see a bit more clearly why this language is appropriate preparation to meet the Advent of Christ. This kind of language - the language that Jesus employees in our gospel reading this week (see below) is called apocalyptic language. Apocalypse simply means to lift the veil and show things as they really are from God’s point of view. It literally means to disclose or reveal a meaning. This is why the book of Revelation is called an apocalypse. The early Christians are suffering the beginning of persecution at the hands of the Roman imperial rule, and it looks like those who have the power of the sword hold the power over world history itself. John writes his apocalypse, the book of Revelation, to tell a different story, a story wherein God defeats all evil through the sacrificial love of Jesus, a story that claims that the evil of Rome will be judged in the end and not allowed to bring harm in the world to come. The colorful imagery that has captivated the imagination of so many over the years is meant to depict the destruction of evil by God, even when it looks like evil might be winning in the short run. For instance, Rome is lampooned as the Whore of Babylon in Revelation, and the like. 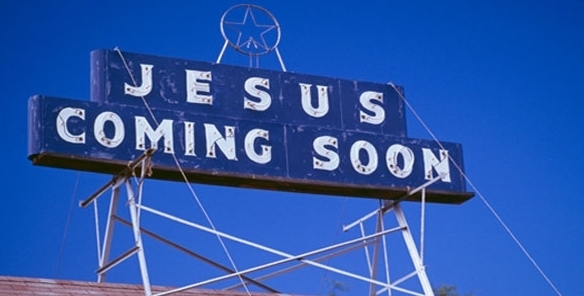 Here the imagery is violent, and the point seems to be that when Jesus comes some won’t be ready for his coming! Scholars are not in agreement over exactly what Jesus means here. Some think he is referring to his coming at the end of history to set things in order. On this view, it is important to be on the right side of history at the right time in history. Some think he is referring to the meaning of his death and resurrection. On this view, Jesus is warning that many will misunderstand and teach the wrong things about the meaning of his life, death and resurrection, and the consequences of following these errant teachers and false messiahs will be grave. Others think he is referring in symbolic language to the destruction of the temple in Jerusalem in 70 AD…. that is a longer discussion that we won’t get into here. It might be that the best way to understand Jesus’ warning is in a more general sense that would apply to every instance in our lives when we assign a meaning to Jesus that is contrary to the meaning that he gives himself, the one in which he faithfully represents God to the world. This God ordained meaning of Jesus’ life, death and resurrection can be summarized in terms of the cross. His life consists in cross shaped service to others and his death on the cross is the atoning sacrifice for our sins. His life reminds us of how we are to be with our neighbor, while the meaning of his death reminds us that our relationship with God is defined by our need to absorb his love and forgiveness. However, sadly, we often make the meaning of Jesus fit into what we we would prefer. Here are some examples that I think are not uncommon. • Jesus as a successful CEO. This one tempts you to embrace power without a proper filter and to measure your life according to how upwardly mobile you are. • Jesus as a sentimental and cuddly figure, like a grandma that bakes cookies and hugs you but whose opinions and advice you could not take seriously in the real world where forward progress is based on the survival of the fittest. • Jesus as a Santa Claus figure that gives out gifts to people who are nice and not naughty: in this case those who would perceive themselves as nice and worthy of gifts would be so unbearably self-righteous that those in their company would live in the terror of wondering when they would be unfriended for being deemed naughty, not to mention the spiritual harm done by self-righteousness to the person who is unrepentantly self-righteous. All of us at times miss the meaning of Jesus as Jesus would have us understand him. But if Jesus is who he said he was and if how he lived and died revealed the fullness of his meaning on his terms and not our distorted meanings that we drift into then there is also hope for us when we are guilty of distorting Jesus’s meaning. There is hope for us because at the heart of Jesus’ meaning as defined by him is the fact that he will not turn his back on us just because we get him wrong; his love is too sturdy and relentless for that. As the Apostle Paul puts it in Romans: “For while we were still weak, at the right time Christ died for the ungodly.”. As we mentioned at the outset, Advent scripture readings bring us close to God’s people when they realize they need his intervention, or else they will lose all hope. May we be vigilant in our celebration of the gospel and reliance on God to help us return daily to a refreshed understanding of who Jesus is on his terms; for therein does lie our only hope.